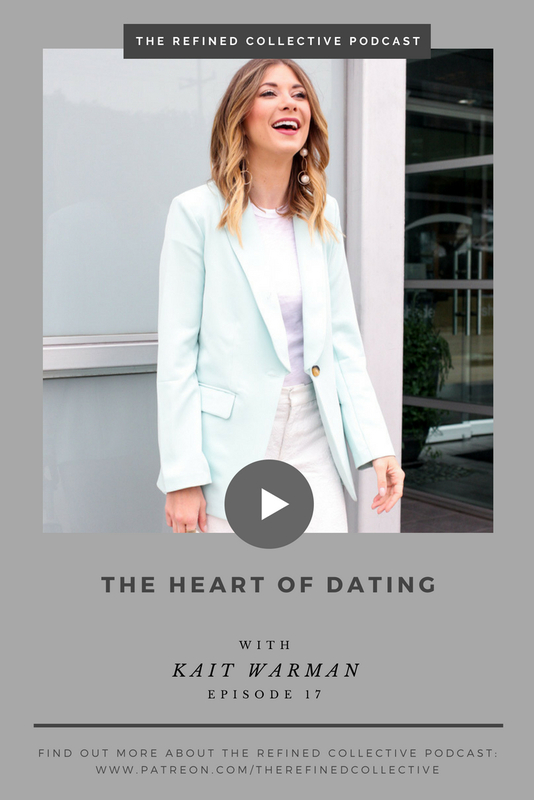 Kait Warman is an LA-based lifestyle blogger, inspirational speaker, creator of the podcast “The Heart of Dating”, and co-founder of the creative content company Kait Kat. She is a dear friend and single Christian woman. She is particularly focused on heartbreak and relationships. And her mission is to empower women to have the courage to own their story, walk in victory, and thrive with purpose. Her hope is that the dating world will change. Today we talk all about navigating the world of dating as Christian women in 2018. Kait tells me about her worst date. She dressed up all fancy for their reservations at a nice Italian restaurant… and he was wearing gym shorts, Nike slides--you know the kind you wear in the shower, and wet hair. Like did he forget they were going on a date, and remember when he was mid-shower? We talk about how men think women’s expectations are astronomical, but they really are not. It’s the little things, and the thought and detail that matter. Whether a walk in the park with a coffee, or remembering something specific from a previous conversation and following-up on that. “I want you to dress up however you like, and be ready for a surprise evening.” –the best date Kait has ever been on. (Of course I had to ask her what her best date was if I asked her what her worst date was). There was romantic jazz music, and a French restaurant involved, you guys. And then, they saw La La Land at the Hollywood Bowl with a live orchestra!! All the feels y’all. We talk about how women like to be pursued. But also what it’s like to create space in an inviting and feminine way--not manipulative--to let a brotha know you’re interested. Back in the day, a woman would sit in a café, make eye contact with a man, and drop her hanky. This was an invitation for him to come pick it up. It let him know she was interested in him. How can we practice droppin’ the hanky today ladies? Kait talks about the book How to get a Date Worth Keeping by Henry Cloud and being active in finding a man. There are so many places to meet a guy, and you gotta to be open to it looking differently than you thought it would look for yourself. Practice the art of being curious. We all have rocky relationship pasts, but discussion of this came to the forefront of Kait’s life in the last few years. The Bible doesn’t have a lot to say about dating in particular. But man does it have wisdom. We all need more resources and The Heart of Dating is that resource. Kait recognizes that she has wrapped up her identity in past relationships, and she fears having that happen again. Recognizing fears is one thing, and moving through them is another. We can’t box up fear and let them sit in our minds. They’ll just fester. She took the time to write out all of the lies she has been telling herself. Then, she replaced those lies with truths. She took control of her own healing. We don’t have just one soul mate. Just think if one person in the whole of human existence made a mistake--the whole thing would crumble. The one becomes the one when we choose them, and then continue to choose them each day. If you want to read more about this, read The Sacred Search by Gary Thomas. It’s important to recognize that we need to be using our time of singleness wisely. This is something we have learned through a mutual podcast guest, Jon Tyson! Give people an opportunity and step out of your comfort zones! Be open to God’s plans. You can find Kait over at @kaitness and @heartofdating. Go start a conversation with her, friends! Make sure to head over to iTunes to subscribe, rate, and review. It means the world! If you’ve already left a review, check out this episode to see if I read your review on air! This episode is brought to you by ME! I made a guide with five days of meditation and prayer. This is our newest freebie so don’t miss out! You can find it at www.therefinedwoman.com/meditation. There is no right or wrong way to use this guide, no matter your faith or meditation experience.